Today just seems like as good of a time as ever to update this list. Seeing how it has been nearly a month’s time since our last view at this list. Some rookies are shining in league games and in once case in SuperLiga games. With only ten or 12 games left on the year (depending on the team) some guys have to make a serious push in the final months of the season to get votes here. A couple guys are still well ahead of the rest. Some guys have fallen completely off the watch and some new faces have come up in recent weeks. I think there is finally a true order to this list as well. Before I had said there was no need to have a true order until we had seen enough out of some players – well I think we have now. And as always, feel free to pipe in your own thoughts and comments on this list with a list of your own. 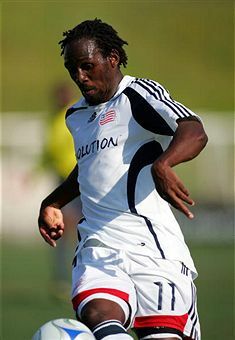 Kheli Dube, New England Revolution – For most people now, Dube is the front runner for this Rookie of the Year award this season. Four goals in 15 games this year for the rookie is some solid numbers. What may be more impressive is the fact that he was a Supplemental pick! Not a SuperDraft pick! Sean Franklin, LA Galaxy – Recent injuries have hindered his progress on this list, not to mention play of his club in recent weeks. Once he gets back to health I think he will still contend and get votes for this award from Dube. But he does have a bit of a hill to climb now. Geoff Cameron, Houston Dynamo – Cameron is a personal favorite of WVH (I had a couple classes with him back in his WVU days before he went to URI). His play recently in SuperLiga has really impressed me and a lot of other people around the MLS world. The more PT he gets the better he is getting. Andy Iro, Columbus Crew – Another defender on the list, for good reason too. I think people under estimate his value on the backline for the Crew. He’s big, strong, and pretty quick. Tony Beltran, Real Salt Lake – May be the biggest mover in recent weeks in my mind. His recent play (and his club’s play) have been outstanding. He’s one of the reasons why that RSL defense is becoming one of the best in the league. Justin Braun, Chivas USA – Not the flashiest of players but still a solid one. But hopes of winning this award henge on how many goals he can put up in the final months. Julius James, Toronto FC – Recent play of his club has hurt James but if they can get their act together you will see him move back up this list. He’s a beast in the air on set pieces and before long he will start coming through on them for the Reds. Eric Avila, FC Dallas – If you haven’t seen him play for Dallas yet go online and find a few clips of him. He’s been solid in the attack for Dallas and has some quality service. Danleigh Boreman, New York – Was up the list but is still down here because his PT hasn’t been as much and his overall play hasn’t been great lately. Patrick Nyarko, Chicago Fire – Don’t be shocked to see him in the top five before long. USL Club To Host USOC Championship?